Celebrating 25 years as Australia's favourite storyteller with new novel Arcadia out now. 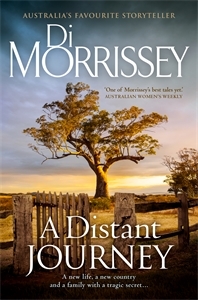 Di Morrissey's, A Distant Journey is a tribute to the real Australia she knows so well. In 1962 Cindy drops out of college to impulsively marry Australian grazier Murray Parnell, moving from the glamorous world of Palm Springs, California, to an isolated sheep station on the sweeping plains of the Riverina in New South Wales. Cindy is flung into a challenging world at Kingsley Downs station. While facing natural disasters and the caprices of the wool industry, Cindy battles to find her place in her new family and continues to feel like an outsider. As she adjusts to her new life, Cindy realises that the Parnells are haunted by a mystery that has never been solved. When she finally uncovers the shocking truth, her discovery leads to tragedy and Cindy finds herself fighting to save the land that she has grown to love as her own.